By Kevin Chang ~ Ernie Cruz Jr. is a friend of mine known mostly for his memorable voice and the era of Hawaiian music he helped start and contributed to along the way. As a musician and friend I am also a fan of his. I am lucky to know him. But Ernie was more than his music. He was just only getting started. I want people to know this. Ernie was just coming into his own. Posted in Uncategorized	| Tagged Ernie Cruz Jr. There is a Hawaiian proverb that says: “(t)he land is the chief; man is its servant.”  It is often cited among Native Hawaiian and grassroots community stewardship networks my organization is privileged to serve. Feeling it might resonate with new friends, I used it in my talk at an inaugural gathering of Indigenous peoples and local community International Union for Conservation of Nature (IUCN) Members in Antigua, Guatemala. The thoughtful reflections in the room affirmed for me that my home – an isolated community over 2,000 miles of ocean away from others – is connected to a larger global family. We can build bridges. 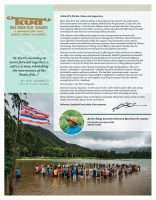 This is a kāhea (call) to our indigenous ʻohana (family) and place-based grassroots leaders from around the Pacific and the world.